5 Topics to Discuss Before Marriage. Friends! I cannot believe how soon I am getting married! In just 26 days I will become a Gettis and it's such an exciting whirlwind ahead. I thought that the last month would go by just as slowly as the past 8 months, but it's going by so quickly!! There have been a lot of things that I've wanted to write about as marriage gets closer and today I decided to take some time and write about a few things that couples need to talk about before marriage. I've read several books and blog posts about marriage, pre-marital counseling, and things to talk with your future spouse about and it got me thinking. So here are a few things that I think you should talk to your fiancé about before saying "I Do." This one is crucial. Who is the money maker? Will you both have full time jobs? Will one be a part time worker and home maker while the other works full time? What types of things will be in your budget? *Yes, you'll need a budget. It makes things SO much easier. * How often will you eat out and can you afford to continue making the purchases and financial decisions you did when you were single? (probably not). You definitely should sit down and make a budget and ask those questions. Mark and I made a temporary budget a few weeks ago, and it was a huge eye-opener and we realized some changes we needed to make to our financial habits. This one can be really exciting... or a little stressful. You need to be honest with your partner. Do you want kids? How many? When? Do you want a pet? (Yes, pets are a part of family planning so they have to be considered too!) Mark and I talked about our personal preference and the dreams that we had for families and we thankfully both agreed on waiting a few years before having children. We both really want a french bulldog though, so maybe after the first year of marriage we'll have a little addition :) Something that is definitely hard to think about is if you and your fiancé aren't on the same page with family planning. If you ignore the differences it can really be hard on your marriage after a year or two. If you want a big family and your partner doesn't or vice versa, it can cause argument and resentment after time so address those issues now. Where are you going to live after you get married? If you're from different states, then this question is huge! If you live in the same hometown, maybe it isn't as high up on the list, but you'll still need to find an apartment or house to live in. Will you live in the city, the country, an apartment, a townhouse, rent a room in a house, etc. There are a lot of options you may not have thought of, and as you make the decision to spend forever together you need to also know where that forever is going to start. Mark's new job is in Harrisburg, about an hour and a half from my hometown. This isn't a big deal to me because it's not super far away but it'll still be a new place and a move that I'll have to make. I'm excited and nervous at the same time! I know that it'll be a new experience, that's for sure! One thing that is super helpful is if one of you moves in to the new place a month or two (or maybe much earlier) before the wedding to get things settled, unpack a little, and explore your new hometown. Figuring out how to pay rent together is going to be a new experience too! If you both work full time, chances are you'll have very different schedules for your time at home. Dinner will need to made/ordered, laundry and cleaning needs to get done, things might need renovating and fixing, and then what about spending time together? Talk about your priorities. Make sure that even if you have different schedules or busy schedules you still make time for each other. Who wants to start out a marriage working all the time without seeing your new spouse? Find time on the weekend, or maybe in the evening to just enjoy one another's company. Take weekend trips if you can. What will happen if one of you works night shift and the other day shift? Where will you go when you both are off of work? Ask these questions so the situations don't come as a shock and leave you feeling lonely or distant. Last, but most certainly not least, talk about your expectations for marriage and for each other. This is something that Mark and I talked about in pre-marital counseling that was a huge help and opened our eyes to some things that needed a little bit of work. I cannot have these big, high expectations for Mark to always be on time, clean, polite, romantic, hard-working, etc. because chances are that one some days he won't be. On some days, he'll be tired or maybe sad or he might even get sick and need taking care of. The same goes for him. We can't expect perfection of one another because when we don't see it, we'll be all the more upset. Marriage does not make a relationship perfect and it is not an excuse to expect the other person to be a certain way or wait on you hand and foot. Marriage is a partnership that requires work and understanding on both ends. It calls for grace. You won't always be a big ball of happiness and humility and neither will your spouse. You need to understand that everyone makes mistakes from time to time. I could go on and on, but the main point I am trying to get at is this: Talk to one another about what you expect and then talk about what you agree/disagree on of those expectations. How can you compromise and what expectations are just not reasonable? Be honest, but be reasonable as well! 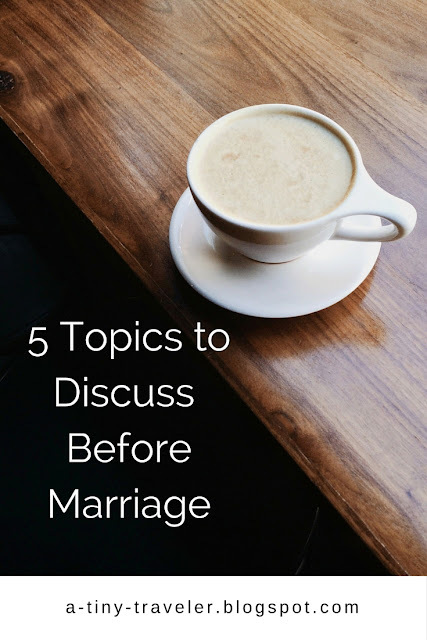 I hope that these 5 topics give you some great things to think about as you take that next step in your relationship, or if you're considering it. I know that these topics really got me thinking about the future I'll have with Mark and where we plan to be in the next few years as well. Talking about all this BEFORE we get married has been such a wise thing and I am so thankful for our mentors that encouraged us to do so. Talking about these topics before you make that lifelong commitment can do three things. First it can show you where you might need to compromise or rethink some of your stances and how you both can make one another happy. Two, it can confirm or deny if you should really be marrying that person. And three, it can get you talking about the big issues prior to them becoming issues in your marriage.